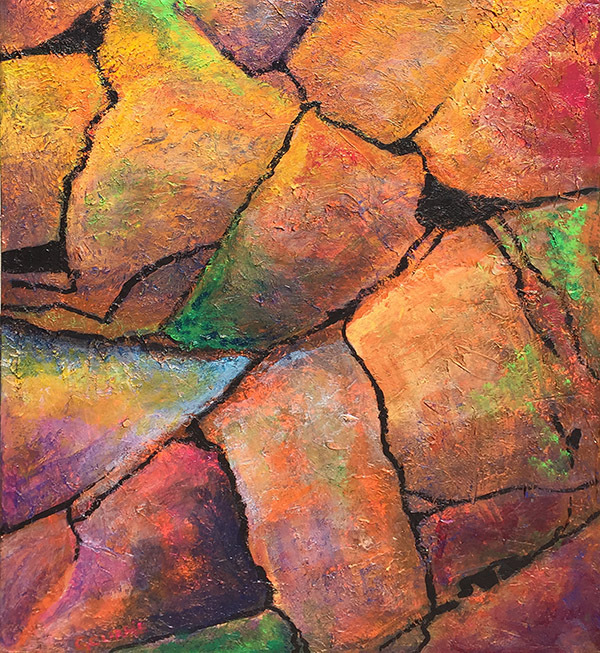 This painting involved initial layers of warm browns followed by a texture medium. This is followed by 45+ coats of transparent colour and layering. I then paint rock cracks and made some minor adjustments. This original is for sale and is priced at $500 CDN or about $370 USD. My paintings can be packaged and shipped all over Canada, the USA and some areas in Europe. We package them properly and then ship insured via Canada Post Express Post. Tracking is included. Shipping costs vary but I can provide a quote and details if required. This original acrylic painting was part of series of painting from different locations around Europe. I was inspired by the architecture, colours and the proximity of the little towns on the water, complete with local fishing boats. 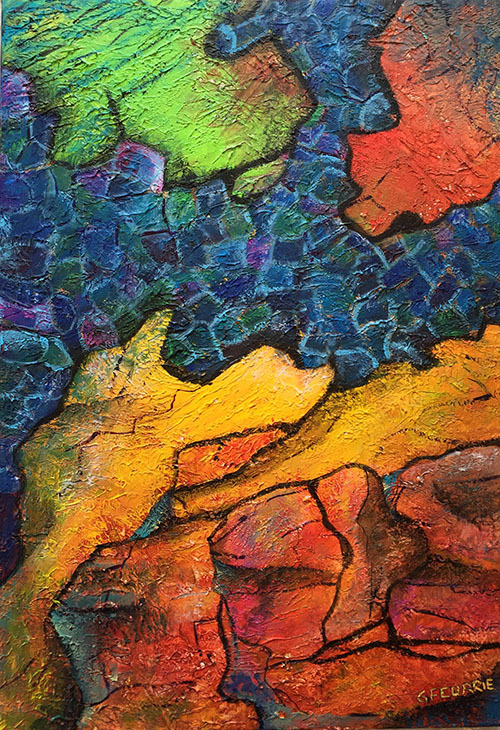 Many different colours were mixed for this painting and it took sometime to get the feeling I was looking for. This paint is for sale. My plans are to look at creating some prints that can be sold in the very near future. As an aside, this painting was inspired by many images I gather but was painted at Moberly Lake, BC where we have a log home on the water. A beautiful day listening to the water ripple was inspiring! 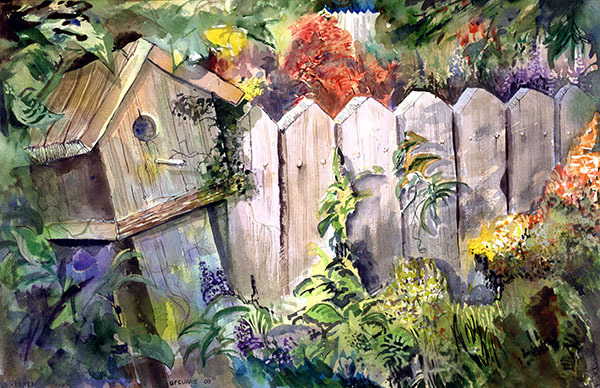 Back in about 2004 I painted a watercolour painting with a birdhouse on a fence. The original painting was donated to a promotion for Secretaries Day in Dawson Creek. The winner was Susan Arseniuk and she still has this painting today on her wall. I also printed a very limited production of prints that were 70% the original and were numbered. At that time I mentioned to many supporters that I would not sell any other prints for at least 10 years. Once the were sold, they were gone. Well after 13 years, I decided (based on dozens of requests) to do another print run of the Birdhouse painting. The prints would be a few different sizes but would be GiCléé prints with inks that last 150+ years. The sizes and the prices are being assembled at this time and I expect to have them available in the next few weeks. If you are interested, please contact me asap as I expect there will be alot of demand and I am once again limited the production run. The above Coloured Stones began as an experiment with mediums. Mediums are pastes and gels that you apply to the surface of a painting or mix with acrylic paint to give certain effects. I wanted a rocky surface effect and so I applied this paste to my painting before adding colour. I then started with shadows and highlights and about 20 different colours. The final stage was to create acrylic washes of colour ( this acrylic paint and mixed with water) for a transparent effect. What you end up with is layers of colours that reflect the light and glow. The above Acrylic Painting is for sale for $300 CDN for the original. It is 18″ x 24″. Contact me TODAY!